The MOG Totally Electric Powered Solar (TEPS) boat wowed the crowd. 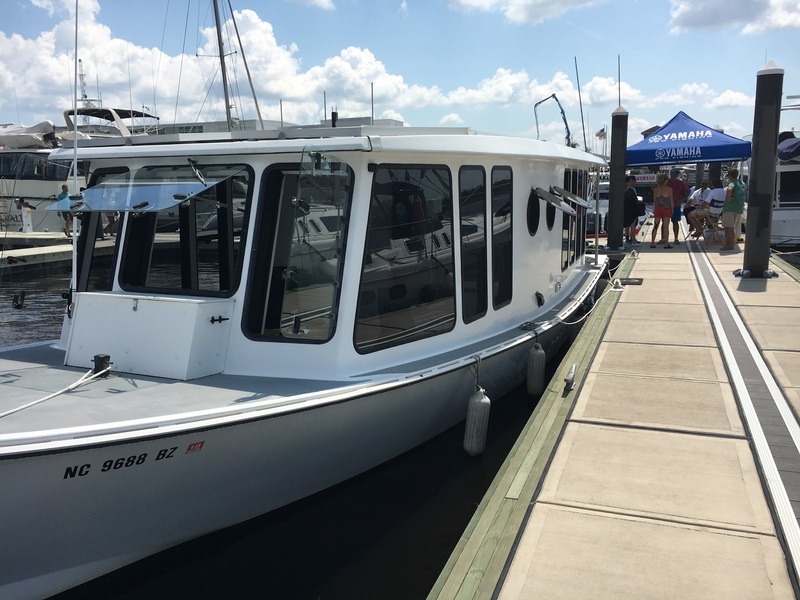 Without a doubt, the inaugural Wilmington Boat Show came off without a hitch. With a planned for crowd expected at about 5,000 the attendance was greater than 11,500 at the gate and that was not counting special considerations such as vendor guests or those that may have attended through the waterway & dock area. 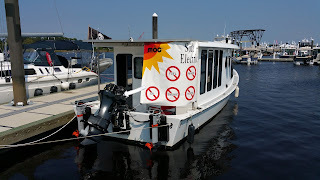 For the TEPS (Totally Electric Powered Solar) boat, over seventy of the hundreds walking through the boat, signed up for the email 'advanced info' service. That service is a confidential notification to those that signed on, to get earlier notification of technology updates prior to MogNavy Blogs. In some cases MOG will get a new or updated technology to test. Often these tests are not mentioned until completed. Those that signed up with their email address will at least be aware that we are addressing a market need and what the time frame, use and expectations are. Heads up will also be given as to a scheduled blog about the product. Some of the products used are subject to Non Disclosure Agreements (NDAs) with a manufacturer which prohibits passing information to the public concerning test data. 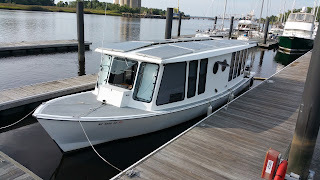 as well as those aboard. We are quite sure that our readers will understand that this is needed so that a product can be reviewed and have improvements made prior to entering the market. It is the manufacturer, at certain times, that will allow us to announce a specific product's use and can be released through the email. In return, MOG gets to test and work with some very interesting eco and high efficiency items. Our readers then get the scoop on what is really new when the manufacturer and MOG agree on lifting the NDA after confidential evaluation. 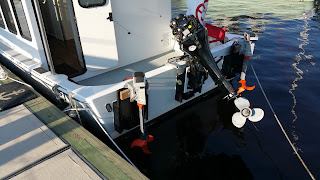 but powerful torqeedo electric outboards. fossil fuel guzzler in the center of the transom. 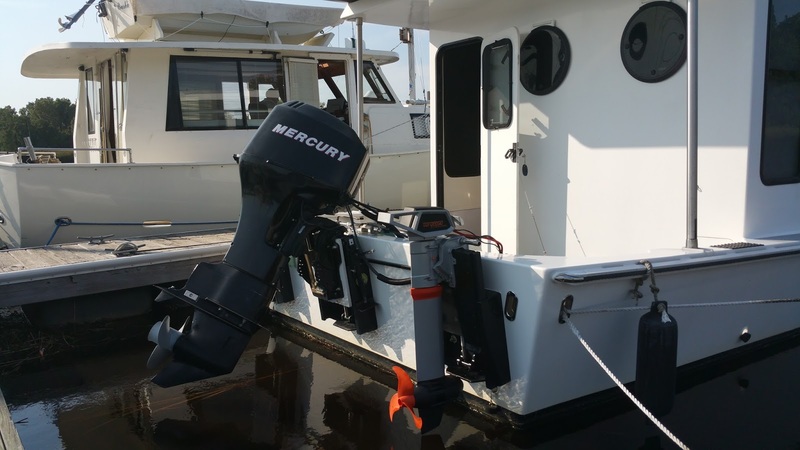 The Torqeedo 4.0 Cruise motors were perfect for getting the comparison across to the show attendees. Seeing a 60 horsepower ICE that could not push the boat any faster (and less control) than two electric motors was an eye opener. 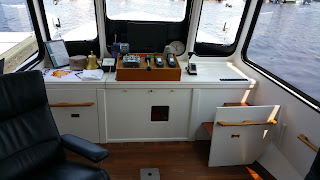 Inside the boat we showed a video of the old motors pushing the boat at speed while relating to the viewer that the Torqeedo was a more advanced outboard, readily available and packed all the power needed for two outboards to negate the use of gasoline or diesel power. Power with no fossil fuels was clearly displayed. Great Loop of over 6,000 miles. A small sample of the new thin solar module material was passed around to the folks boarding the MOG for a tour. The thin film modules will drop the module weight from about 40 pounds to just 4 pounds. Not only is that a drastic weight loss but the new modules come in many more sizes which allows more efficient use of space on the roof. 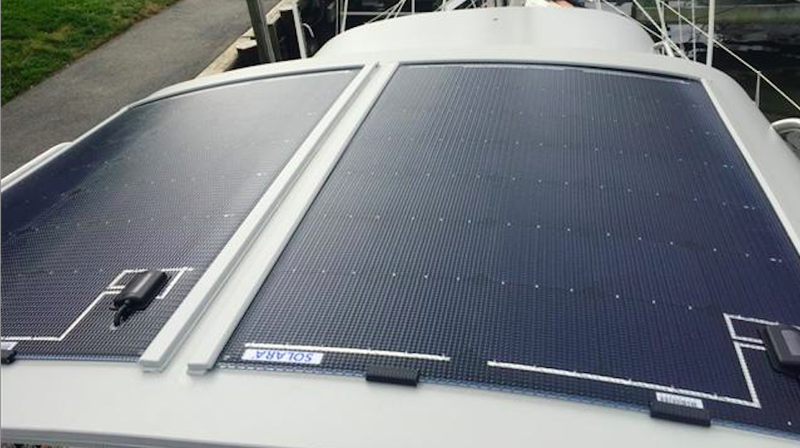 With better use of roof space, over 3,000 watts of power can be generated. Simply put, the boat can cruise in a straight line, at a sailboat speed (without tacking) without significantly taxing the batteries. That kind of efficient energy use should allay any fears of range anxiety. and a more dense array yielding higher power output..
solar electric collection modules might appear on the roof. the roof space, providing additional power.